Do you have a set of play dishes? If so, then this washing dishes activity is perfect for you! 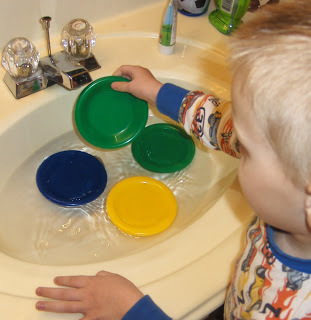 Give your child the chance to wash their play dishes in the bathroom sink. It is the perfect height (with a stool), not too much water (soap optional), and tons of fun! When B does this, he spends a long time washing, drying, sorting, and a little splashing too. It is the perfect activity for him to work on while I clean the bathroom and let’s face it those dishes need a little cleaning once in awhile! A great activity for little ones! Oh my daughter just loves to “do the dishes”. We also bring them in the bathtub sometimes! so much fun! we do the doll clothes thing, too! Ha ha. Look at that – you are posting about chores too! Once again we are on the same page. You must be my long lost twin or something. Waterplay is such a soothing experience for children. I like to add a little baby shampoo for soap. We wash dishes all thet ime here! My kids have always loved washing things, so if I ever need help with dishes, lawn furniture, toys, etc. they are more than willing to help. I think kids just love water and bubbles!! What a GREAT idea!!!! I have done this with my preschool classroom, but what an awesome idea to do with my Sunshine while I clean the bathroom! TY! I need to do this. More hands = less stress right? HAHA thanks for the link up.